Lladro Lovers' Waltz. Size: 11.75" x 8.25"
The bride and groom take over the dance floor as family and friends look on with great emotion. The first notes strike up and the happy couple begin their first dance as man and wife. Lovers’ waltz is a piece inspired by one of the moments all married couples remember with special fondness, the music that accompanies them forever and plucks their heartstrings whenever they hear it. 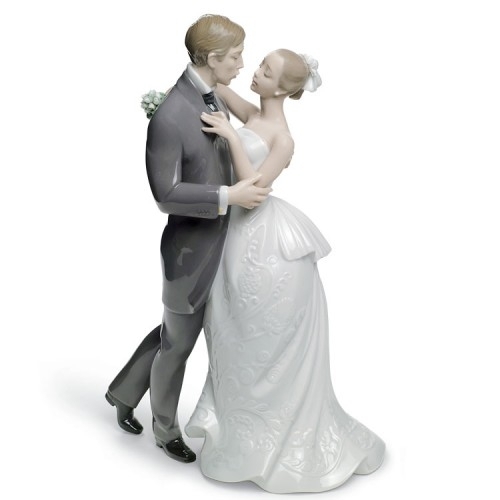 A classic piece both in its decoration in glazed porcelain as well as the clothes worn by the bride and groom. Worth underscoring is the wealth of ornamentation in the bride’s dress, and the bouquet of roses she holds in her hand.